Callistola Dejean 1835: 363 Nomen nudum. Oxycephala Chapuis 1875: 228 (not Guérin-Méneville). Plesispa (Plesispella) Chûjô 1943: 325. Body elongate; subparallel; color red with yellow-brown markings; total length 6.0 to 18.0 mm. Head: large; with cephalic plate which is angulate at corners; frontal horn long, acutely pointed at apex; maxillary palps filiform, elongate, palpomere 1 short, 2 longer, claviform, 3 obconic, ½ length of 2, 4 subequal in length to 2, truncate at apex; eye large, convex, coarsely facetted. Antenna: filiform; slightly longer than head and pronotum combined; with 11-antennomeres; antennomere 1 incrassate; 2 to 10 subequal in length, cylindrical; 11 slightly longer than 10, pointed at apex. Pronotum: narrower than base of elytra; subquadrate; lateral margin straight, then sharply constricted near apex; anterior angle obliquely rounded, with seta; anterior margin rounded; posterior angle acute; posterior margin bisinuate. Scutellum: oblong; pointed at apex. Elytron: lateral margin straight, smooth; exterior apical angle obliquely rounded; apex subtruncate; humerus angulate, not produced; with 8 rows of punctures basally and apically; interspaces 2, 4, and 6 costate basally. Venter: prosternum with anterior margin not projecting forward, not partly covering mouth. Leg: short; robust; profemur thickened; tibia short. Admiralty Islands, Australia, Bismarck Archipelago, Indonesia, Micronesia, Moluccas, New Britain, New Guinea, Solomon Islands. Described species: 38 (Staines 2012). Key: Gressitt 1957b, 1960a, 1963. Cocos, Freycinetia, Flagellaria, Pleomela (Arecaceae); Heliconia? (Heliconiaceae); Pandanus (Pandanaceae). Chapuis, F. 1875. in J. T. Lacordaire, Histoire naturelle des insectes. Genera des Coléoptères, Vol. 11, Famille des Phytophages, 420 pp. Encylopédique de Roret; Paris. Chûjô, M. 1943. Chrysomelid‑beetles of Micronesia. Memoirs of the Faculty of Science and AgricultureTaihokuImperialUniversity 24(3):281‑334. Dejean, P. F. M. A. 1835. Catalogue des Coléoptères de la collection de M. Le Baron Dejean. C. Crevot, Paris. 136 pp. Dejean, P. F. M. A. 1836. Catalogue des Coléoptères de la collection de M. le comte Dejean. 3rd ed. Paris. 503 pp. Gressitt, J. L. 1957b. Hispine beetles from the South Pacific (Coleoptera: Chrysomelidae). Nova Guinea n. s. 8:205‑324. Gressitt, J. L. 1960a. Papuan-West Polynesian hispine beetles (Chrysomelidae). Pacific Insects 2:1-90. Gressitt, J. L. 1963. 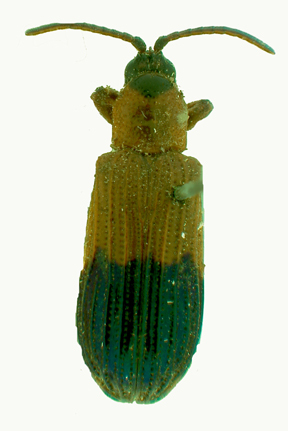 Hispine beetles (Chrysomelidae) from New Guinea. Pacific Insects 5:591‑714.